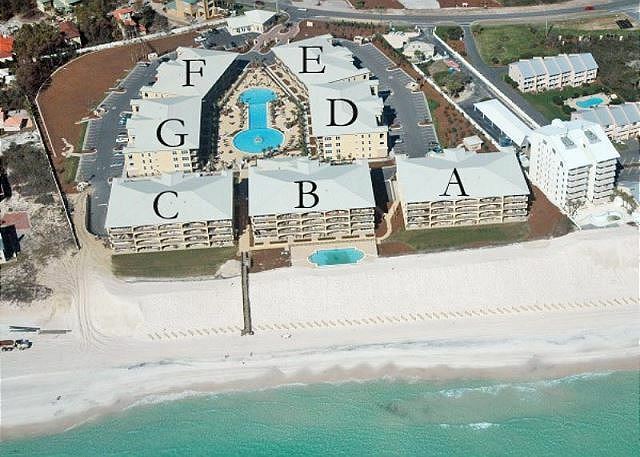 Adagio C-103 Beach-front, 4 bedroom, ground floor unit! Newly remodeled! Gulf front luxury awaits you in C103, as this unit begins an all new season with Adagio 30A!!! You will experience exquisite views from your ground floor private patio, as you relax at the highest point in Blue Mountain Beach. Your family can enjoy games on the lawn just a few steps from your living room on the beautiful well-sodded green, while over-looking the Gulf of Mexico. The patio is uniquely furnished with this perfect location in mind!!! In 2017 this unit was renovated from the inside out. The goal was to create large living in the conventional condo space!!! 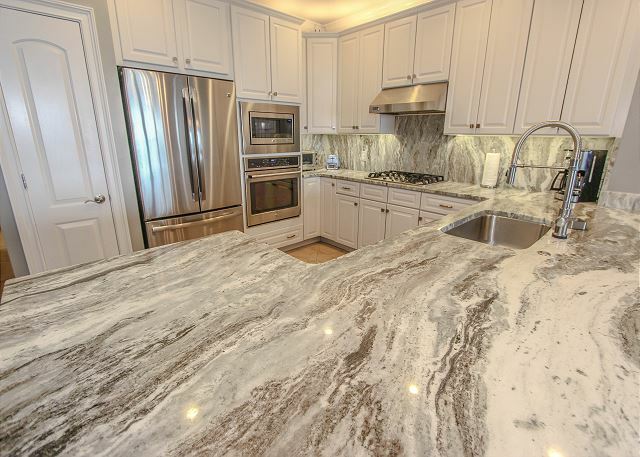 The re-designed kitchen maximizes the beautiful view and offers a feel of endless living on the Gulf of Mexico. New granite countertops and full backsplashes set the tone for all new top line stainless steel appliances including, GE Cafe gas cooktop, GE Cafe convection/conventional cooking in both the microwave and the large wall oven, French door refrigeration, separate ice maker, and even a sleek new over-size sink, with whisper-quiet disposal and state of the art Delta automated water faucet!!! The living room hosts a separate mirrored dry bar, redesigned fireplace surround, new eclectic furnishings, unique art, and a 65" wall-mounted SMART television. The dining area has a beautiful imported 60" round table that will easily accommodate six for dinner. The cathedral chandelier provides just the right amount of light throughout the room. The newly designed counter height peninsula allows additional seating space for dinner or a large serving areas for buffets. In C-103 you will find each guest bedroom has new engineered hardwood flooring, unique updated ceiling fans, 40" wall mounted SMART televisions, new king-size bedding, additional closet storage shelves, and window treatments. In addition, the master bedroom has exquisite art, a wall-mounted 60" SMART television, and blackout drapes. All of this is new for 2017 with the full renovation!!! All bathrooms have an expansive new look with sleek modern under-mount sinks, marble-topped vanities, spacious statement mirrors and enhanced lighting. The master bathroom now includes a new extra deep 6 foot soaking tub, eliminating the Jacuzzi of the past!!! Who likes cold showers??? To support the needs of as many was 10 guests, with showers and laundry, hot water heating was updated to a large commercial quick recovery heater!!! No cold showers, here!!! I think you will agree, this unit provides the newest trends in living along this little rural highway!!! 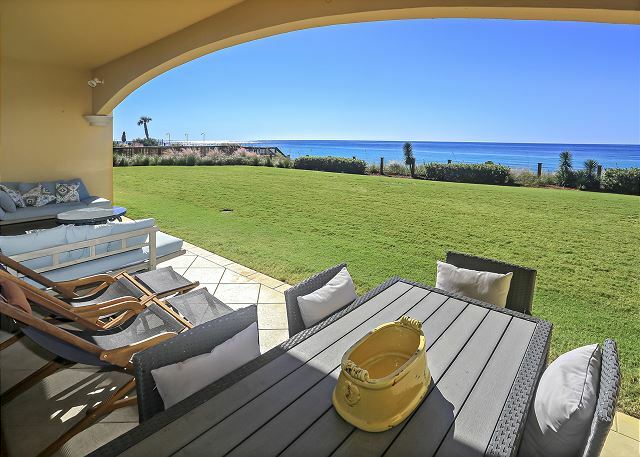 Adagio features two Spectacular Pools--The 1,700 square foot gulf side pool is heated and has an infinity edge overlooking the blue green waters of the Emerald Coast. The main pool is an amazing 8,000 square feet that is cool even on the hottest days and includes three tiers with fountains and waterfalls. A large whirlpool spa overlooks the pool. The European cobblestone deck includes a variety of seating areas including lounge chairs and dining tables. The fitness center is centrally located near the pool. Adagio's convenient location allows for quick access to neighboring Grayton, Seaside and WaterColor where you will find some of the finest shopping and dining venues around. The area also offers a spectacular 17-mile biking/hiking trail along historic beach highway 30A. Destin is just 12 miles away. Bring your bikes or rent them while you’re here. The bike ride along 30A crosses some of the most spectacular inland lakes in the world. This is our 3rd time to stay at the Adagio. (Previously building A) We enjoyed our stay again. We like the units on the gulf side so we can hear the waves and have easy access to beach. The photos online are accurate - the unit is well decorated and comfortable. The Adagio property is clean and well maintained, and if you have a problem, they are quick to fix it. (They stopped kids from playing fowl music on the beach and some others from smoking on the balconies.) The beach is nice because it is private, but the Adagio is close enough to Seaside/Watercolor and Gulf Place that there is shopping and nightlife. We rode bicycles to both of those areas - renting from La Dolce Vita which is right by the entrance gate at Adagio. We will be back. What a great place to stay. The home is comfortable and spacious with a location that can't be beat. Highly recommended. Beautifully appointed, comfortable beds, outstanding communication from management. Absolutely the best location, best unit, best ocean view, and most gracious staff combined to make the best vacation ever! We will absolutely be back! The condo was great and worked perfectly for our group of 9. My four grandchildren were able to stay in the room with the 2 sets of bunk beds and they loved it! Condo was spacious, had very nice furnishings and comfortable beds. This is our 10th year at Adiago and this is by far the best unit we’ve stayed in. Great for our two older kids who are married. We rebooked for next year. Condo is wonderful and everything is just as described. 360 properties was wonderful to work with also. We enjoyed being on the grass and so close to beach. Also, the owners have kid friendly items in the house. A stool, pack n play, and sippy cups. Just the little touches make a big difference. We thoroughly enjoyed our week! We had a great stay at Adagio - we stayed 4 nights before Thanksgiving. Adagio C-103 is newly renovated from top to bottom with all new countertops, paint and appliances. It feels very modern with gray and white tones. The kitchen is very spacious and has everything you need - lots of dishes, wine glasses, pots/pans and tupperware. The master bedroom and bath are very large with an oversized closet, a big tub and walk-in shower. Two guest rooms have en suite baths, and the bunk room has access to one of the baths from the hallway. All newly painted and in great shape. We had good weather and the beach was not crowded - there are many large homes near this condo and most were empty, so we had large stretches of beach to ourselves. The property was also well-managed and there is plenty of parking, with 2 very nice swimming pools. 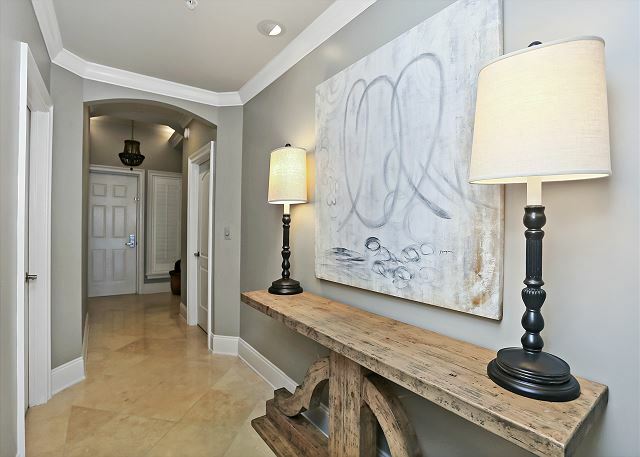 Close proximity to a few good restaurants and a Publix. Being on the first floor, it is a bit noisy in the afternoon with kids playing in the green space just off the patio, but it's great if you have young children, they can walk out the back door and have plenty of space to run around. We had a GREAT time staying in this condo and would highly recommend it. We had a wonderful experience staying at the Adagio in condo C103! Beautiful unit and we were welcomed and cared for the entire trip! 110% satisfied! Thanks so much!